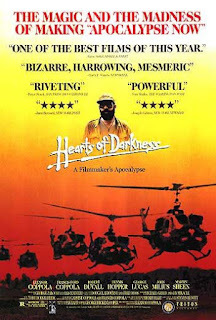 Tag line: "The magic and madness of making Apocalypse Now"
Inspired by Joseph Conrad’s novel Hearts of Darkness, Apocalypse Now had been in development since the late 1960s, when John Milius first wrote its script (at that point, there was talk about shooting the movie in Vietnam, with George Lucas directing). It was shelved until 1976, when Francis Ford Coppola, the driving force behind the project, decided to direct it himself. With the U.S. military refusing to support a film about the Vietnam War, Coppola struck a deal with Ferdinand Marcos of the Philippines, who agreed to lend the production troops and equipment. Shooting began in the Philippines in February of 1976 and was scheduled to last a few months, but due to inclement weather, trouble with the actors, and other issues, 236 days would pass before Apocalypse Now finally wrapped. For Coppola, these production woes were only part of the hell he experienced while making the movie. Deciding to use Milius’s original script as a guide, Coppola ended up rewriting much of it, turning it into a story about warfare in general, and the effect it has on both the individual and society as a whole. But as shooting dragged on, Coppola realized Apocalypse Now was falling short of his ultimate goal, and on top of everything else he had no idea how to end his movie. Over time, the director became increasingly convinced he was making, as he put it, “A $20 million disaster… a failure”. Using footage shot by Coppola’s wife, Eleanor (who was by his side throughout the production) as well as conversations she had with her husband about the film (which she secretly recorded), Hearts of Darkness: A Filmmaker’s Apocalypse takes us behind-the-scenes of Apocalypse Now, pulling the curtain back on its troubled production and the personal trials and tribulations of the man who made it. The problems that plagued Apocalypse Now started almost immediately; Harvey Keitel had been cast in the pivotal role of Capt. Willard, but after a few days’ shooting Coppola wasn’t happy with Keitel’s interpretation of the character, and decided to replace him. So Martin Sheen was brought in, but Sheen himself would suffer a major heart attack during production, resulting in further delays. In addition, the Philippines were rocked by an enormous typhoon, which shut Coppola and co. down for two months (so sets could be rebuilt). Not even the equipment on-loan from the Philippine army was reliable; right in the middle of shooting an important battle sequence, five helicopters were called away to fight rebels in the nearby hills. On top of all this, Marlon Brando was insisting he start on-time, and threatened to pull out of the project (and keep the $1 million that Coppola paid him in advance) if his scenes were pushed back. At home, the trade papers reported on the never-ending insanity, mocking Coppola and his many delays with headlines such as “Apocalypse When?” and “Apocalypse Forever”. Before long, even those involved in its making wondered if Apocalypse Now would ever see the light of day. And then there was Coppola, writing notes on cards and toiling away at his typewriter, trying desperately to turn Apocalypse Now into a personal endeavor, yet realizing he was coming up empty at the most crucial times. He argued with Dennis Hopper (who played an American photojournalist and one of Kurtz’s disciples) about what his character should say, and spent days on end discussing Kurtz with Brando (both actors would ad-lib their lines). An entire scene set on a French plantation, which Coppola had hoped would link the country’s past with its present (a glimpse, as it were, into the history of warfare in Vietnam), didn’t work as the filmmaker intended, and once shooting on this sequence wrapped he announced to the cast and crew that he was cutting it, and they should forget it ever happened. We sense Coppola's frustration in moments such as these, as well as the many talks he had with his wife; at one point Coppola even said he wanted to kill himself. In my opinion, Apocalypse Now is one of the all-time great war films, and Coppola’s message about the nature of warfare rings loud and clear. This is what makes Hearts of Darkness such a fascinating documentary; it is proof positive that even in the midst of chaos, something truly extraordinary can be achieved. 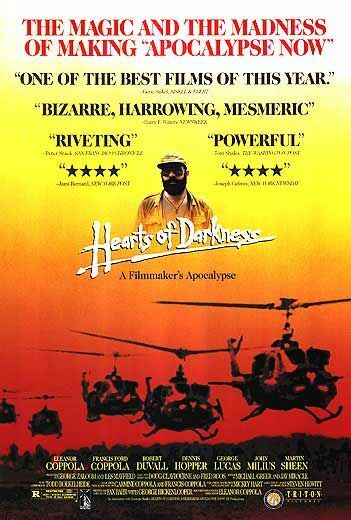 As for Hearts of Darkness: A Filmmaker’s Apocalypse, it is, without question, one of the most revealing documentaries ever produced about filmmaking, and stands as a testament to both the artist and the creative process in general.